A beach cruiser is a bicycle with wide balloon tires, an upright seating position, and wide cushioned seats. 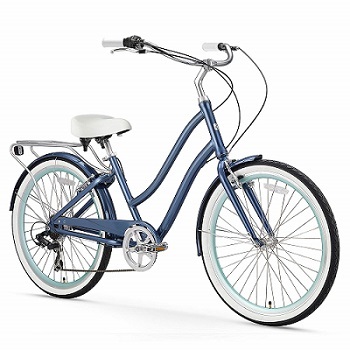 Unlike road bikes and mountain bikes, beach cruisers are made primarily for recreational use. Built for comfort and easy to ride, they have sturdier and heavier frames made from steel or aluminum. The frames are often curvy and brightly painted giving them a classic, retro look. Because they are relatively simple mechanically, beach cruisers are easy to maintain and not too expensive. Today, you can find beach cruisers made by several different companies. Each one offers its own unique look, features, accessories, and options. Some of the most important considerations when shopping for a beach cruiser are size, brakes, frame, tires, gears, and style. These best beach cruiser bikes reviews will help you get started by describing and explaining the articles they offer and how well they perform. 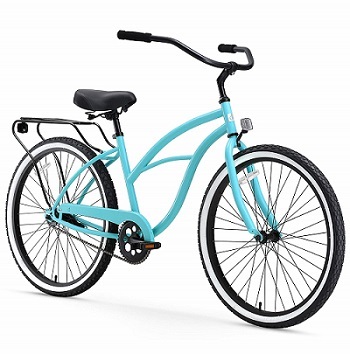 sixthreezero EVRYjourney is all-in-one women’s beach cruiser is a 26-inch size, which fits riders from 5 feet 6 inches to 6 feet 4 inches with 7 speeds. It also comes in a smaller 24-inch size and with the option of 1, 3, or 21 speeds. The 17.5-inch aluminum frame is lightweight. It is a step-through frame, which means you can easily step over it to mount and dismount and put your feet down flat on the ground when you stop. The pedals are positioned to be in front of the seat so that your legs will fully extend. This helps to keep you in an upright position while you are riding. The entire frame is designed with a low center of gravity, making you feel stable and secure. This bike has front and rear handbrakes and an easy to use single handle shift for switching gears. Its whitewall semi-slick tires are 1.95 inches wide, not quite as wide as those on some other cruisers, and it has a wide dual-spring saddle. It comes with many accessories and extra features like matching rear and front fenders, a seat rack, and a built-in kickstand. This bike performs well for leisurely trips of up to 30 miles and for cruising around town. It appears in three colors and has a hip and stylish look. It comes 80 percent assembled and weighs 38 pounds. The Firmstrong Urban Lady is known for its versatility, style, and functionality. It is a single speed bike that comes in two sizes, a 26-inch, and a 24-inch model. It is also available at multiple speeds. The frame size of this cruiser bike is 15 inches, which is a bit smaller than the sixthreezero EVRYjourney, and it is made from steel. The fork curves forward which makes it easier to steer and shock absorbent for a comfortable ride. It is smooth and comfortable to bike ride and pedals smoothly. The single speed version uses coaster brakes to stop. This provides the bike a clean look because there are no brake cables. The aluminum wheels are light and shock absorbent, and the wide white-wall balloon tires have a slick waffle thread that grips surfaces well. The oversized saddle is wide and well-cushioned with dual springs for added comfort. The handlebars are wide with synthetic leather grips, and a chain guard is included to protect your clothing. Matching fenders and a bell are optional. With just one speed, this is an excellent bike for casual riding around town. It appears in a variety of color choices and 80 percent assembled. The simplicity and quality of this bike are its most impressive features. It is a good choice if you are looking for a classic beach cruiser that performs well at an affordable price. This Around the Block women’s cruiser is made by sixthreezero, the same company as the EVRYjourney, and is similar in some ways. Both come in two sizes and with the option of single or multiple speeds. The primary differences are in the material and frame styles. The frame of the Around the Block is slightly smaller, at 17 inches, and it is made from steel rather than aluminum. Also, it is not a step through the frame like the EVRYjourney, so it is a bit more difficult to mount and dismount. The front fork does sweep forward for a relaxed riding position. Its wheels are slightly wider measuring 2.125 inches, giving it a sturdy and stable feel. It has coaster pedal brakes on the single-speed version and handbrakes on the multi-speed version, a wide and cushioned saddle with dual springs, and wide sweeping handlebars with foam grips. In addition to these standard features, it comes with some extra practical accessories, such as a rear bike rack and a chain guard. Additional accessories can be added on later if desired. This is a nice feature if you want to keep the price down and not pay for things that you don’t need. This affordable and attractive cruiser performs well on short, casual rides. It comes in 12 color choices, 85 percent assembled and weighs 38 pounds. This is the men’s version of the Firmstrong Urban Lady bike reviewed above, and it is similar in many respects. The standard 26-inch size will fit most men comfortably, and it also comes in a 24-inch size. It is a simple, single-speed bike, so it has a clean look, is easy to ride, and requires little maintenance. It has a 17-inch strong steel frame and a classic masculine look. The rear coaster brakes are easy to use, and the aluminum thick white-wall balloon tires are 2.125 inches wide and provide a smooth, cushioned ride. The oversized seat has dual springs for added comfort. It has wide handlebars with synthetic leather grips and comes with a chain guard to protect your pants from grease and from getting caught in the chain. Color-matched fenders are not included but can be added on. This is a high quality, low-maintenance bike at an affordable price. It is durable and can carry a lot of weight, making it a good choice for larger men. It comes in 13 color choices, 80 percent assembled and weighs 38 pounds. 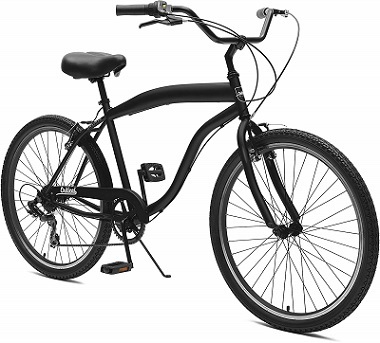 Its sturdy and strong frame and its classic style set this bike apart and make it one of the best beach cruiser bikes for men on the market. 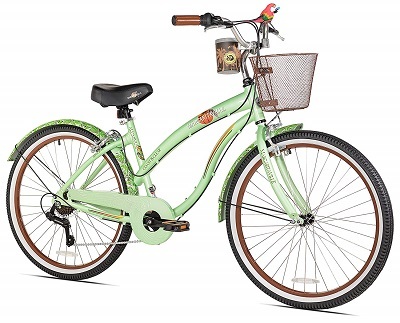 This beach cruiser by Margaritaville is a stylish 26-inch bike with a Shimano 7-speed drive train. It has a lightweight custom designed aluminum step-through drop frame, although it does not drop down as low as other drops down frames so this feature will only work for taller women. The lighter weight of the aluminum frame makes it easier to carry this bike and can be helpful on long rides. The alloy front and rear side pull brakes are safe and the twist style shifter is simple and easy to use. 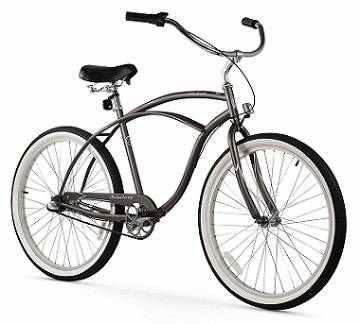 The whitewall tires with alloy rims contribute to the bike’s classic cruiser look. It has a soft padded seat, high-rise handlebars with deluxe grips, non-slip pedals, and a quick release seat post clamp. What makes this bike unique are its many fun accessories, features, and decorations. It comes fully equipped with full coverage fenders with graphics, a wire mesh basket, a cup holder, a bottle opener, a parrot engraved steel chain guard, and a horn. It even has a plastic parrot attached to the handlebars. This bike performs well for recreational use and short rides around town. It features a classic cruiser look and the Margaritaville logo. It is a bit on the expensive side and the ride is somewhat bumpier because of the aluminum frame. Nevertheless, it is a well-made bike that is extra cute and fun to ride. This stylish 26” women’s cruiser comes only in a 7-speed version and has twist shifters on the handlebars that are easy to turn for changing gears. Schwinn, an iconic company with a long history that dates back to 1895, makes this cruiser that provides riders from 5 feet 4 inches to 5 feet 9 inches. It is similar in many ways to the Margaritaville cruiser reviewed above. The primary difference is that the step-through frame is made of steel and drops lower for easy mounting and dismounting and to allow standing when stopped. The step over height is 19 inches. The alloy linear pull brakes are added to the front and rear wheels for safe and fast stopping. The swept-back handlebars have soft grips and the saddle is comfortable, cushy, and quilted with springs and trim. It appears with amazing, great features like matching front and rear fenders and a rear bag carrying cage. The style of this bike is simple, classic, modern, and innovative. It is a bit more difficult and time-consuming to set up and requires more maintenance than some of the other cruisers because of its multiple speeds. Still, it is an affordable bike that is excellent in terms of overall safety and performance. This 26-inch men’s cruiser by Critical Cycles is a single-speed bike. It also comes in 1, 3, or 7 speeds. It has a classic hand-made tensile strength steel frame with a thicker top tube. The upright, high handlebars are designed with a sporty BMX style and soft foam grips. They protrude upwards and out for a wider grip that gives you more control over the steering. The old-fashioned foot coaster brakes on the single-speed bike are easy to use and maintain. The Wanda tires are an extra wide 2.25 inches, which gives the bike a stable feel and absorbs shock. The minimal tread pattern provides solid traction and the double walled rims give the wheelset added durability and protect tire tubes. The saddle is plush and wide, but not as comfortable as the seats on other cruisers. You might want to replace it with a more comfortable saddle. A kickstand and a classic paint job are included. 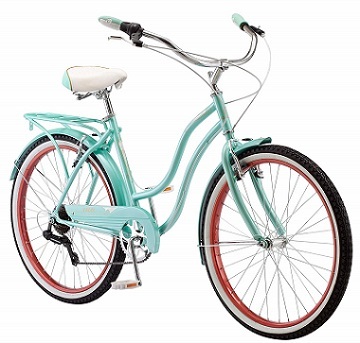 This attractive bike is easy to maintain, easy to assemble, and comes in a variety of colors. All of the tools you need to assemble it are included. It is one of the lightest cruisers, weighing just 37 pounds. This is an excellent bike if you are looking for an affordable cruiser with classic style and a few unique twists in its features and design. This 7-speed men’s cruiser bike by Kent Oakwood is 26 inches and can hold up to 320 pounds. The frame, made from lightweight, rust-resistant aluminum, is durable and strong, and it will fit most men comfortably. The gears are a great feature if you live in a hilly area and make the bike more versatile than single-speed cruisers. Its front and rear handbrakes are reliable, safe, and responsive, and the shifter is smooth and easy to use. It comes with an enclosed chain cover to protect your pants, a quick release seat post clamp, and a super comfortable foam paddled saddle with springs. This is a high quality, easy to ride, and affordable bike. It assembles easily in 30 minutes, but it is slightly heavier than some other cruisers, weighing 40 pounds. The style of this bike is another great feature. It is eye-catching, sleek, and masculine in appearance. This is an excellent opportunity if you are looking for a stylish bike that is versatile, handles well, and is good on hills. The Firmstrong Bruiser is a men’s cruiser with a Shimano Nexus internal 3-speed hub. It has a 26-inch white frame with black tires and rims. It also is available with a single-speed or 7-speeds and comes in a variety of colors. It fits men of most sizes from 5 feet 4 inches to 6 feet 4 inches and has a 350-pound weight capacity. This smooth riding bike has a curved 19-inch extended steel frame and a beefy thick top tube design. This extra length of this elongated frame increases the space between the rider and the handlebars, letting you extend your arms for a more relaxed and laid back riding position. The single-speed version has a simple and easy coaster brake, while the multi-gear models use one or two caliper hand-operated brakes. The gear systems are simple and easy to use. The wheels are painted aluminum in a choice of rim colors and the tires are 2.125 inches wide balloon-style whitewall tires that absorb shock. The understated tread design increases traction and grips the road firmly. The wide oversized seat is soft, comfortable and plush with double coil springs. The wide cruiser style handlebars have water-resistant synthetic leather grips. The seat and handlebars are flexible for height and tilt for a perfect fit. This cruiser performs well for recreational riding. 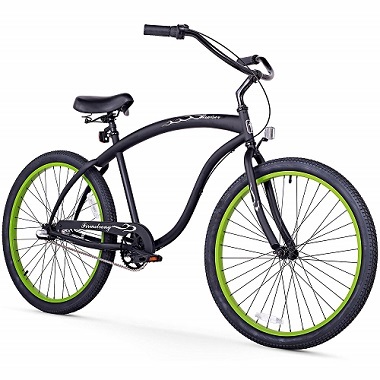 It has no frills, a modern and simple style, and a beefier and more aggressive look than many other beach cruisers. It weighs 38 pounds and comes 80 percent assembled. The extended frame and solid look of this affordable cruiser set it apart from the others on this list. 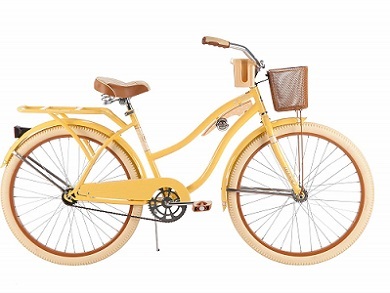 This 26-inch women’s cruiser by Huffy has painted a bright and cheerful butter yellow color and has a classic look. It is only available in a single-speed setup, which gives it that simplicity that cruisers are famous for and makes it easy to use and maintain. The step-through curvy steel frame is sturdy and the seat is positioned further back for a lower center of gravity, an upright riding position, and full leg extension. The raised handlebars help you relax and eliminate fatigue in your wrists, arms, neck, and legs. Both feet can be flat on the area when you stop for comfort, balance, control, and safety. The reverse pedal coaster brakes are easy to use and low maintenance. The tires are wide measuring 2.125 inches and have alloy rims for all-weather use. They come in a selection of several colors. A densely padded and embroidered Huffy cruiser saddle with springs gives the bike a smooth and comfortable bike ride. The handlebars wrap around on the sides and have ergonomic rubber grips that look like leather. It comes fully equipped with accessories including sturdy, classic looking fenders to help keep you clean and dry, a rear rack and wire basket, a beverage holder, and a kickstand. What sets it apart from other cruisers are its attention-grabbing colors and style. With curves on the frame, matching fenders, brown grips and saddle, and reflectors all over, this bike will turn heads. It is affordably priced, decked out with all the accessories you could want, and fun and easy to ride. There are undoubtedly many features that all beach cruisers share, but there are a number of different types of cruiser bikes on the market today. 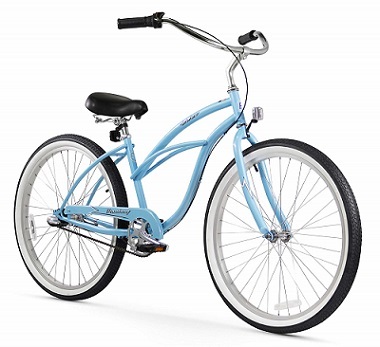 The classic beach cruiser is the most popular and basic style. It has upright seating, a comfortable seat, extended handlebars, and 26-inch fat tires. Most have a steel frame, a single-gear, and coaster brakes. Stretch cruisers have extended handlebars and longer frames. The pedals are pushed further forward and the riding position is more relaxed. A low rider cruiser sits lower to the ground and has reclined seating and flashy features, while a chopper has an elongated fork, hanger handle bars, and different sized tires, making it look more like a chopper motorcycle. Women’s and men’s cruisers are similar, but they do vary in terms of their shape, size, and aesthetics. Men’s cruisers tend to have thicker top tubes, while many women’s cruisers have step-through frames. These make it easy to get on and off the bike and to rest your feet on the ground when you stop. While the classic cruiser is a single-speed bike, multi-speed cruisers with more than one speed, usually 3 or 7 and sometimes 21, are becoming more common. These are great if you live in a hilly area, but they do require more maintenance than the traditional single-speed models. They also make the bike look a bit less simple and clean. If you will be using the cruiser for short rides on flat terrain, you won’t need gears, but for longer rides and slopes, gears will make it easier to ride. Most beach cruisers feature coaster brakes, which are used by pedaling backward. Coaster brakes are easy to use and maintain and keep your handlebars clear and free of brake cables. However, they depend on the force you are able to expert pedaling backward and won’t work if your chain drops. For this reason, most multi-speed cruisers have handlebar brakes which are safer and easy to use but require more maintenance. Cruiser bike size is determined by wheel diameter. Cruiser bikes come primarily in two sizes, 24 and 26 inches. 26-inch cruisers are the standard and fit most adults over 5 feet tall. While other types of bikes come in more size options and offer more precision fits, cruisers are not as dependent on an exact fit. By adjusting the handlebars and saddle height, you can fine-tune the bike for a better fit. Most cruisers have wide, balloon-style tires with just a little tread for better traction. These tires provide a smooth ride and absorb shock well. They vary in width from around 1.95 inches to 2.25 inches. Classic cruisers have 26-inch whitewall tires with alloy rims and 32 spokes. Some models offer other rim colors and smaller sizes. Most beach cruisers have steel frames, but some have aluminum frames. Aluminum frames can be lighter in weight and rust resistant but are usually more expensive than steel frames. Cruiser frames weigh between 35 and 55 pounds, making them heavier than the frames of most other types of bicycles. The average weight for cruisers is 38 pounds, which is heavy enough to provide stability at coasting speeds but light enough to carry without too much difficulty. The style and accessories are what makes cruisers fun to ride. Some have extras included while others let you add on the features you choose and tailor the bike to your own particular needs and personality. Some common features and accessories you will find on cruisers are fenders mounted on the tires that prevent the rider from getting splashed, chain guards to protect your clothing from getting caught in the chain or smeared with grease, baskets on the handlebars and racks on over the rear wheels, cup holders, reflectors, lights, seat covers, and kickstands. One of the best aspects of beach cruisers is that they are so low maintenance, but if you require it to last a long time and perform well, there are a few basic things to know about how to take care if it. For starters, you should protect your cruiser from moisture and rain by keeping it indoors or in a garage. Moisture can lead to the improvement of rust on the chain or frame, which can permanently ruin your bicycle. If you are riding your beach cruiser in sandy areas, be careful not to get sand in the chain and gears. If you do, blow it out with air or wipe it off with a smooth cloth. Sand can damage the metal parts of your bike and shorten its lifespan. Keeping the mechanisms on your beach cruiser lubricated will help them work more smoothly and efficiently. For long-term storage, consider keeping your bike inside or covering it so it will stay dry. It can be a huge disappointment to get your cruiser out for a spring ride only to find that it is rusted and cannot be repaired. The heavyweight and stability of cruisers make them some of the safest bikes out there. The upright riding style is also less likely to cause neck and back strain than other riding styles. Still, there are a few safety precautions that you should follow when riding a cruiser. Before you set out for a ride on your cruiser, inspect the brakes and chain and add air to the tires if necessary. At the beginning of the season, take it to a bike shop for a tune-up and inspection. If your cruiser bike gets a lot of use, it is a good idea to have it checked out more frequently. When riding a cruiser, you should always wear an approved bike helmet. Take care when riding in traffic and obey all traffic laws and signs. If you are riding on a paved path, you will be sharing the path with pedestrians and runners. Always alert them when you pass by using your bell or your voice. If you are riding at dawn or dusk, be sure to have reflectors, or better still lights, on the front and back of your bike and to wear reflective clothing. Be sure to lock your cruiser securely when leaving it unattended. Investing in a high-quality lock, such as a U-lock, will help keep your cruiser safe from thieves. Because beach cruisers are relatively inexpensive and used for recreational purposes, you might be tempted to leave it unattended, but be aware that thousands of bicycles are stolen every year. It is not surprising that beach cruisers, like many other classic items from the past, are making a comeback. Their style, comfort, and features make them great for short leisurely rides, and they are affordable and easy to maintain. The best beach cruiser bikes are versatile, sturdy, functional, and smooth to ride. 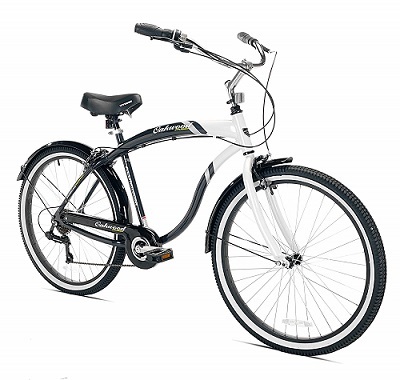 A top choice for a women’s cruiser is the sixthreezero EVRYjourney Women’s Step-Through Hybrid Cruiser Bicycle because of it’s all around versatility. The aluminum step-through frame is sturdy and safe. For men, the Firmstrong Urban Man Beach Cruiser Bicycle is a top choice. It is affordable and classic in its design. In the end, the choice will come down to your personal taste, your budget, and your specific needs, but knowing the basic features of these best beach cruiser bikes is an excellent place to start.